It’s certainly the football season as a record goal was scored with £1006 for Korky’s 1944 annual. Of the half-a-dozen copies we have auctioned since 1999 this was the first Fine copy and it more than doubled a VG issue from last year. 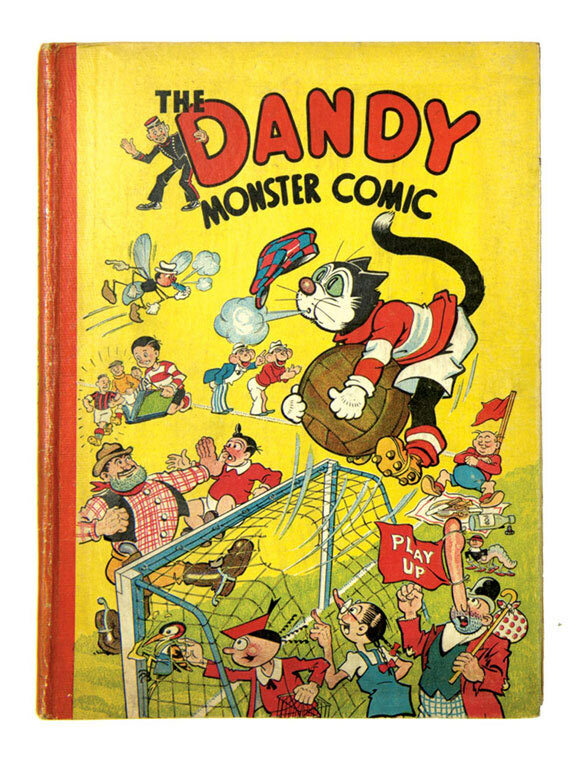 Please watch out for our next auction in November as we have some high grade Beano Books on offer from the same period. 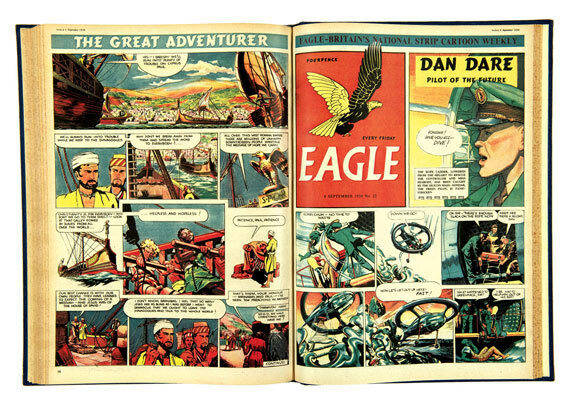 Another cracker exploded with the first 26 issues of Eagle volume one. This lot was all about provenance and grade. 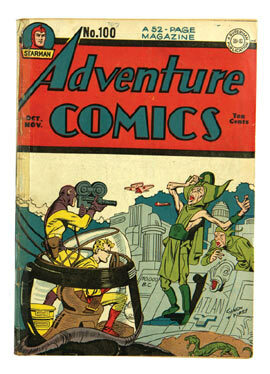 The volume was bound as a file copy by publishers, Hulton Press and then owned by comics historian, Denis Gifford. The number 1 was in very fresh condition along with the other twenty-five and an interplanetary £2062 finally took the spaceships away. 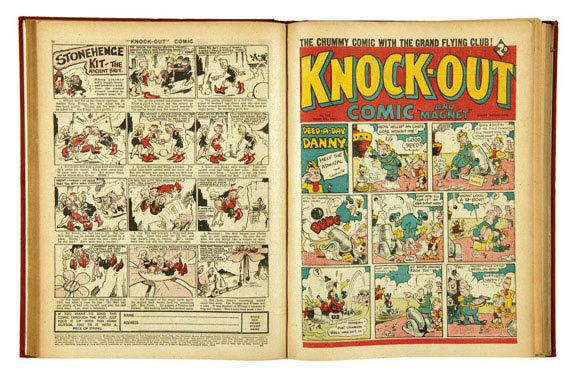 Knock-Out retains a strong core of collectors and whilst a half year in bound volume from 1941 did very well at £282 (just over £10 a copy), the complete year of 1946 were also publisher’s file copies and excelled at £553. The Gremlins featured in the comics but not in the heavyweight winning bid. 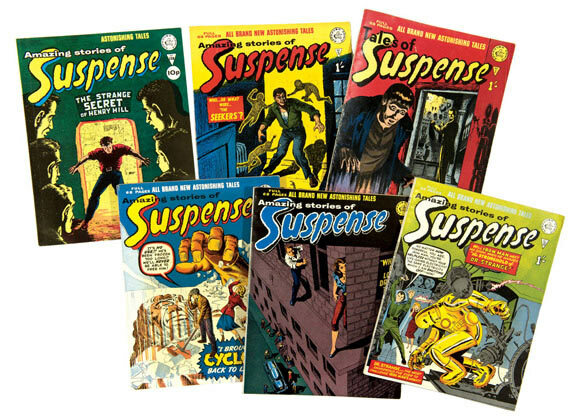 Thriller Comic Library are always hard to locate in decent condition as the centre staple often rusts through to the front and back covers and the paper spines wear quickly. 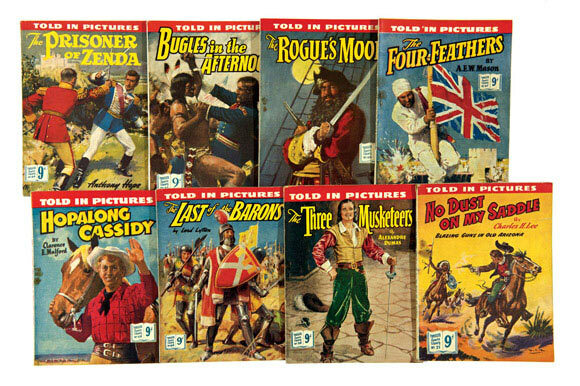 This small unbroken run starring Blackbeard, Hopalong Cassidy and The Three Musketeers certainly covered all the adventure genres and was bid to £88.00 in mainly fine grades. 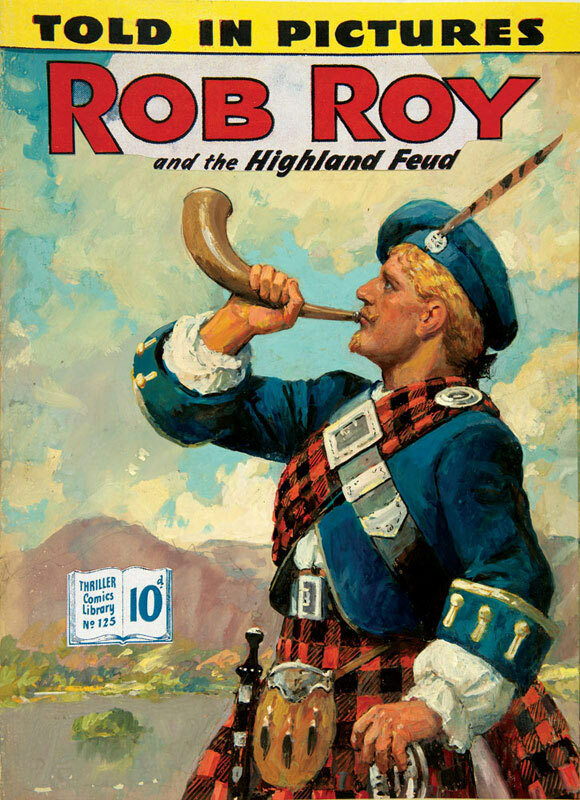 Thriller Comics Library artwork doesn’t come around so much and the original front cover artwork of No 125 Rob Roy was by artist, Septimus E Scott. As a member of The Royal Academy, you’d think that painting covers for comics would be a lowly occupation for someone so illustrious; but like the rest of us, he had bills to pay so this work held its own reward. Secured at £314. 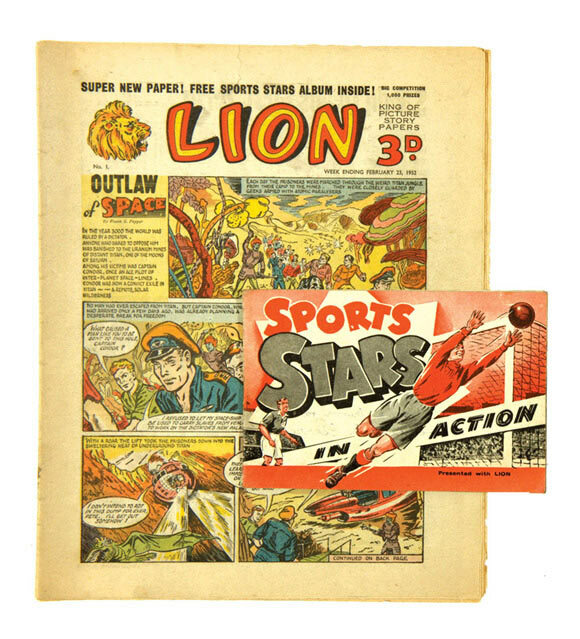 Here was the first issue of Lion comic with all-important Sports Stars from 1952 free gift album. 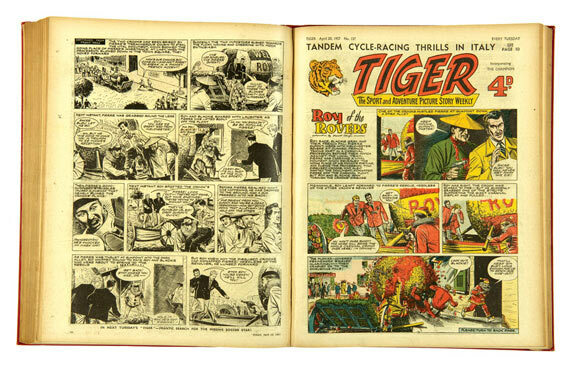 Presenting Captain Condor (almost Dan Dare in disguise - Eagle collectors will tell you ‘in disgust’) and Jungle Robot, later retitled Robot Archie, the lion roared at £121. Tiger was also quite vocal with 96-147 in two bound volumes. Publisher’s file copies starring Roy Of The Rovers and Rockfist Rogan lifted £334 in [fn/vfn] grades. 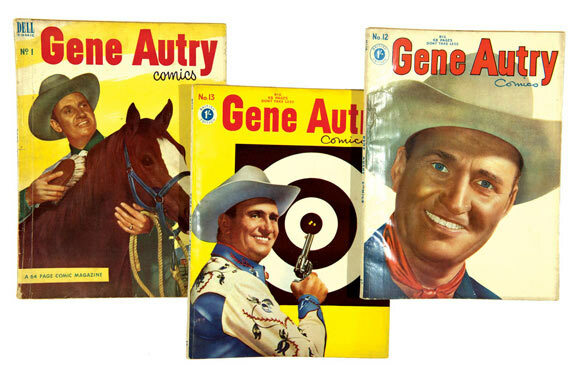 The cowboys are still popular, Gene Autry 1-19 saddled £69 and John Wayne, Pecos Bill and The Little Sheriff rode into the sunset, the 38 holstered with £157. 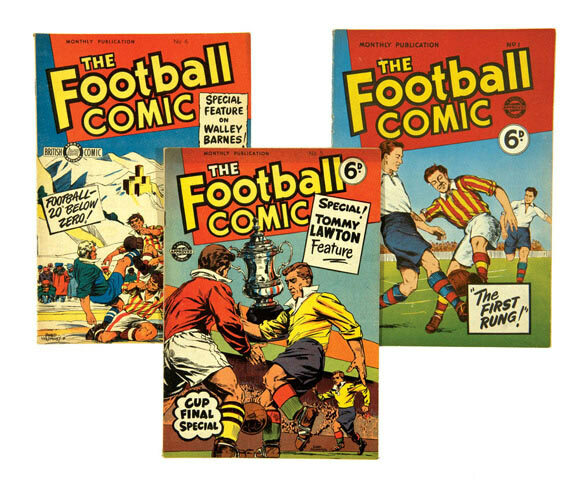 Some reference books don’t even list The Football Comic but issues 1, 5 and 6 were not ignored by well-informed bidders who took full advantage at £120. 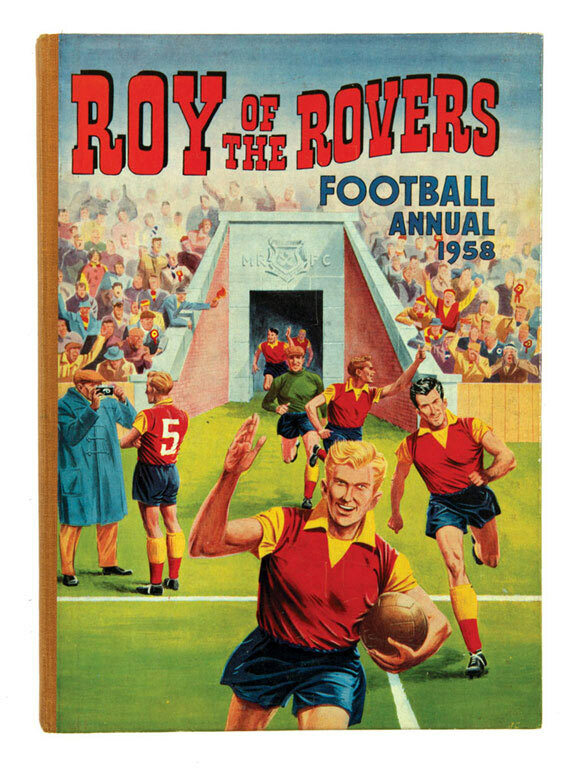 Here’s Roy Of The Rovers first annual from 1958 in fresh condition and tackling £110 without a problem. 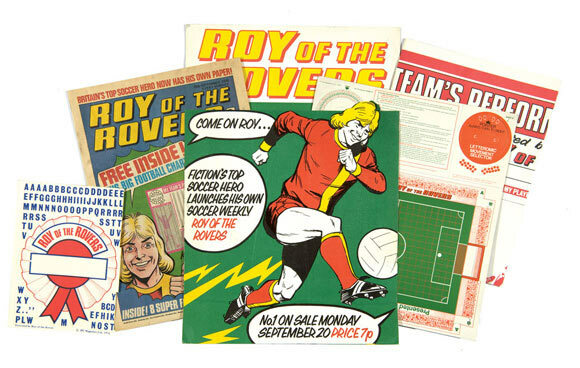 A Roy Of The Rovers comic, even the number one, would not normally attract that much interest as mid 70s titles are not so rare. This one was different as it was kept by one of IPC’s sales reps and came with its own trade promotional folder with free gifts for 1, 2 and 3. Only a few of these fully illustrated folders were ever printed and the winning bid of £368 fully reflected this. 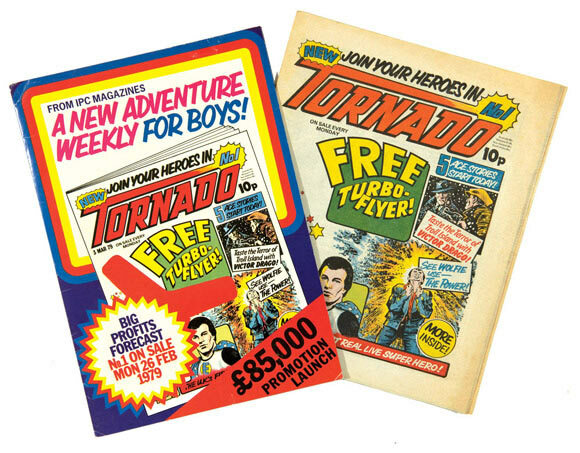 TV Tornado No 1 was similarly enclosed with its IPC trade promotional folder but in this case the number one was just as rare being an undated pre print run copy. Tharg went larg with £121. 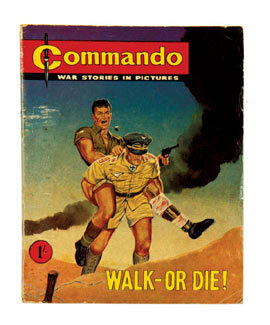 We offered an early run of Commando War Stories In Pictures from No 1 up to No 39, most in separate lots to help collectors missing these elusive early issues. Walk – Or Die! in [vg+] ran to £475 , No 3 rated £111 with 4 at £121 and 5 making £83. The balance single issues in higher grades averaging £88-120 each. 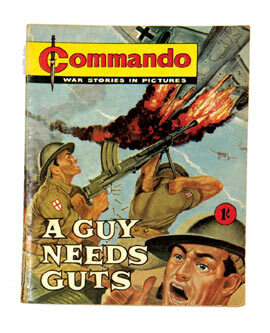 Commando is a highly rated title but values do vary. A year ago we auctioned a No 1 for a staggering £825, 2 rival bidders taking that Fine copy to a picture library record. 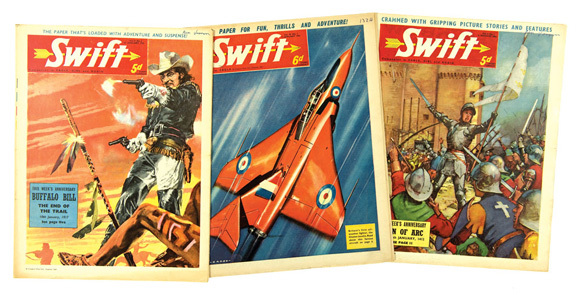 Swift was the companion paper to Eagle for younger readers and a near complete run from 1962-3 starring Rob Roy, Buffalo Bill, Blackbow The Cheyenne and the Happy Hussar are well remembered characters along with some brilliant fighter aeroplane covers by Airfix Models artist Roy Cross. 53 issues at £2 each represented a very good buy for the canny winning bidder. 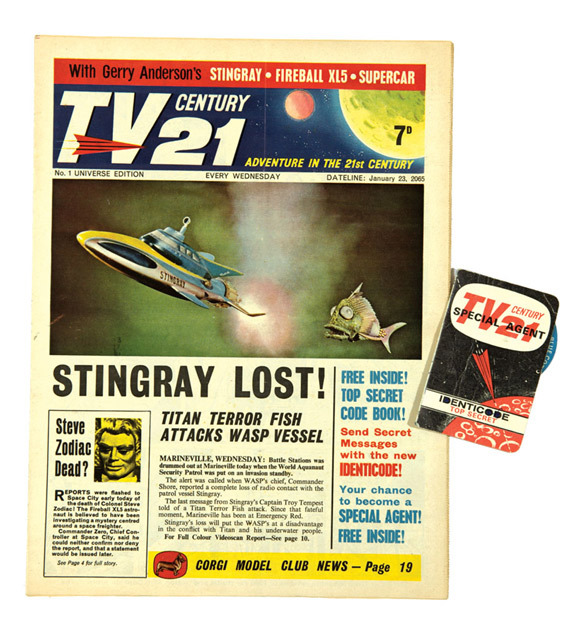 The popularity of TV Century 21 is as strong as ever, you only need a reminder of the recent brilliant TV ad campaign by SpecSavers starring Thunderbirds to understand that. A free gift Special Agent Identicode Membership Card accompanied a Very Fine graded No 1 and this rare combination conjured £554, a price that may even seem reasonable in the years to come. 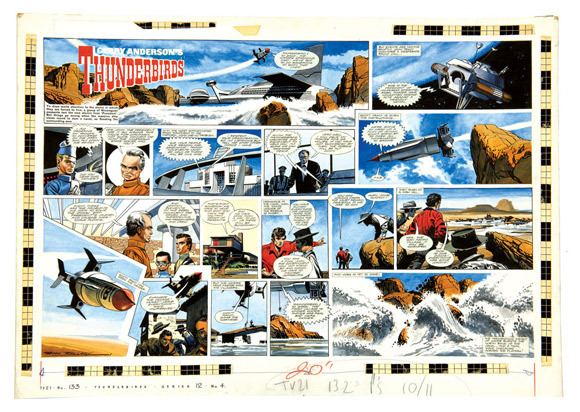 There was another piece of Thunderbirds artwork on offer this September, and Frank Bellamy’s signed board painted with quick-drying Pelikan inks is an enduring testament to his vibrant artistry. Bellamy encompasses every commercial artist’s dream: work of high quality uncompromised by high volume. Thunderbirds were go at £2750. 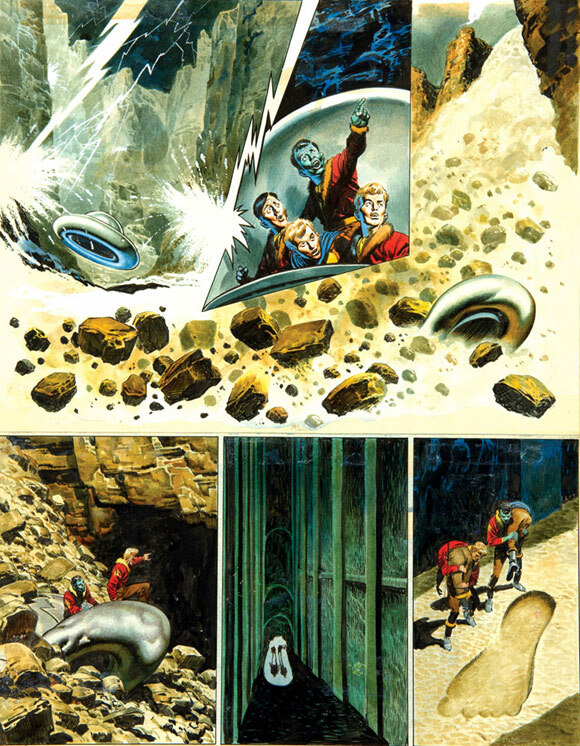 Ten years ago Don Lawrence’s artwork for The Trigan Empire used to fetch in the region of £200-400. That was until June 2008 when we sold Don’s front cover artwork for The Look And Learn Book Of The Trigan Empire published in 1973. That special piece went for a record price of £1650 and we had not seen a board at auction since then. We offered a Trigan page of Janno crashing his spaceship during a storm and this action piece from 1968 broke the record once more at £1705. Along with our collectors, we think Mr Lawrence’s artwork has been revalued. 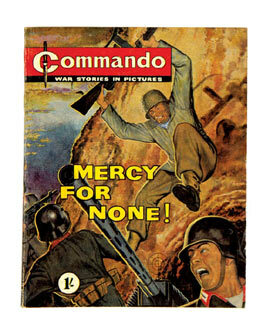 Victor 1-44 was offered in fresh grades with a Victor double-page flyer and included ads for Commando one and two. I Flew With Braddock flew with £484. 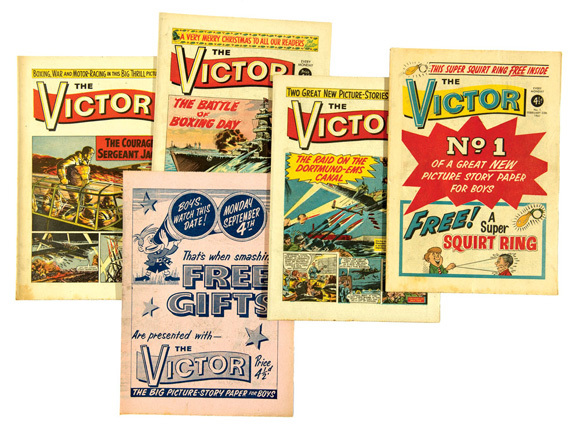 A further lot of the first four Victor Book For Boys made £44. 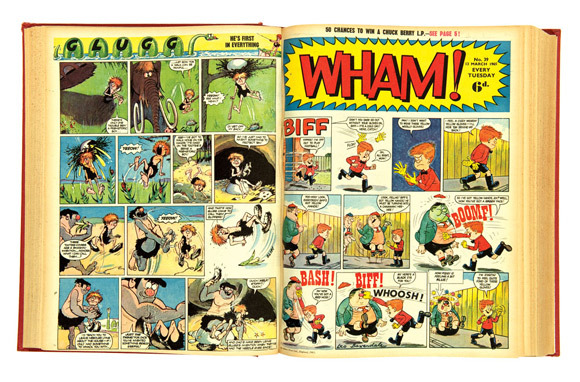 Leo Baxendale’s opus, WHAM! 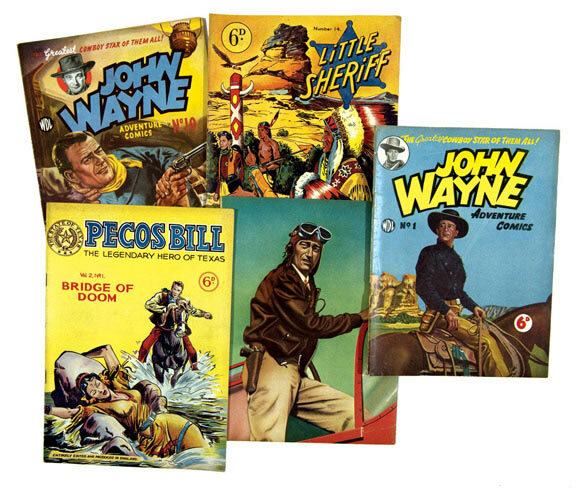 was available in four bound volumes enclosing issues 1-184 and these publisher’s file copies starred General Nitt, The Tiddlers, George’s Germs and Ken Reid’s Frankie Stein. 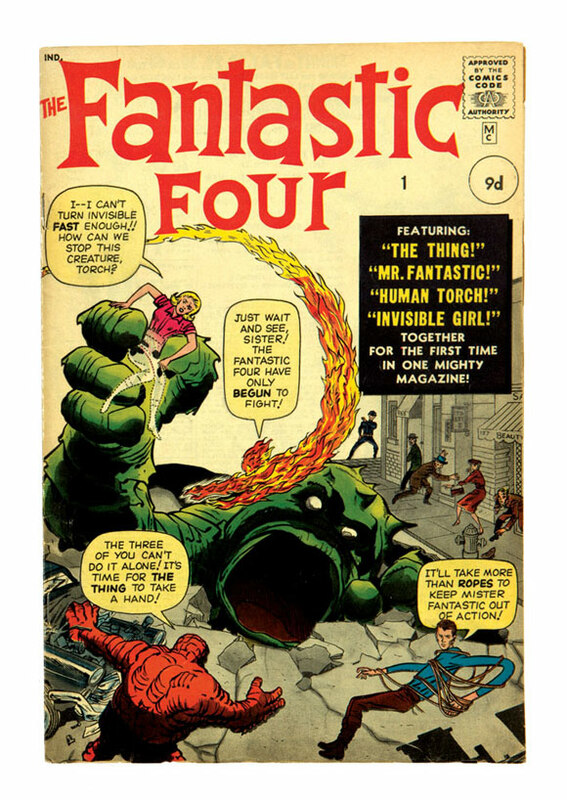 We noted that No 112 reprinted US Marvel’s Fantastic Four #1 and £602 secured them all. 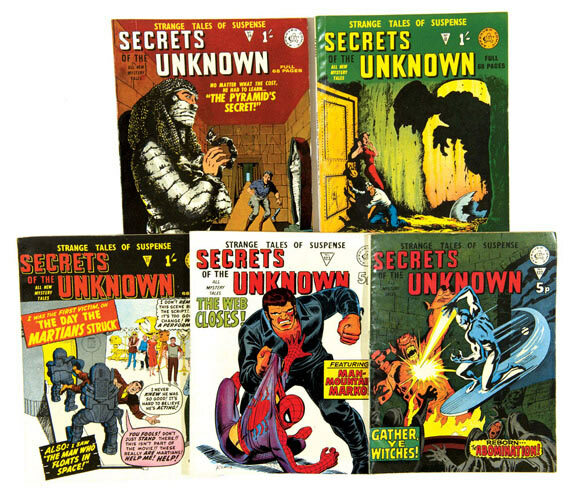 In the early 60s Alan Class started to reprint UK editions of Atlas, Marvel and Charlton comics. With garish covers and black and white pages printed on low grade paper stock, these square bound copies were cheap and widely available. Low grade was not really an issue for collectors as the preponderance of glue used in the binding process eventually caused the paper to shrink and the spines to curl and split. 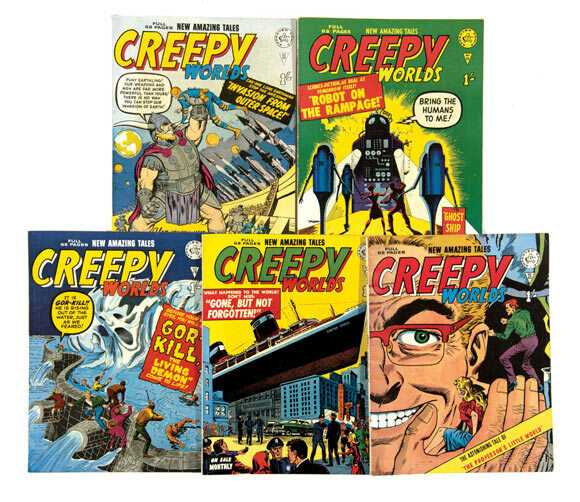 We offered a collection in unrivalled grades – flat, fresh copies of Creepy Worlds, Secrets Of The Unknown, Sinister Tales and Suspense, all in separate lots. £8-9 each were prices realised for items usually found well under a fiver apiece. 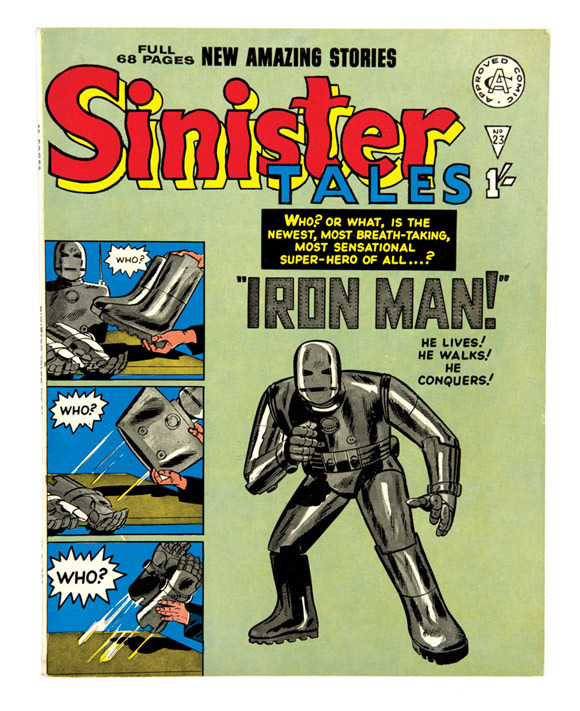 One of these Alan Class reprints was Sinister Tales 23 which happened to be the UK version of Tales Of Suspense 39, better known as the first appearance of Iron Man. £66 was duly tendered. 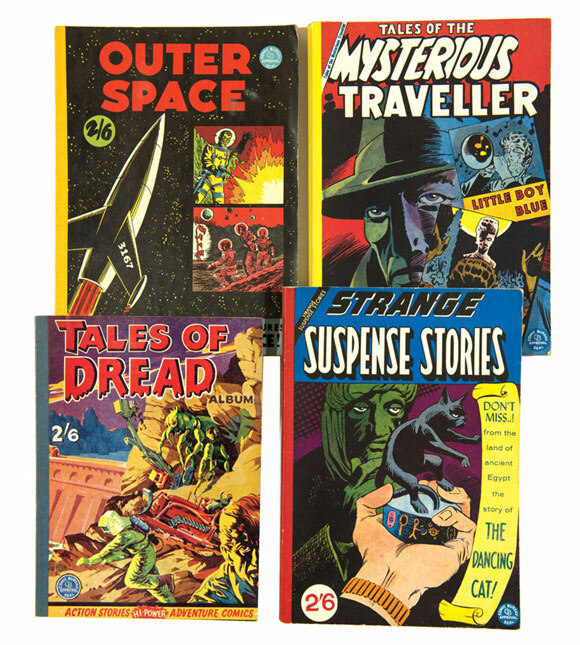 Four 2/6 reprints by GT Ltd were annuals containing Charlton reprints by Steve Ditko, Norman Light and Ron Embleton. 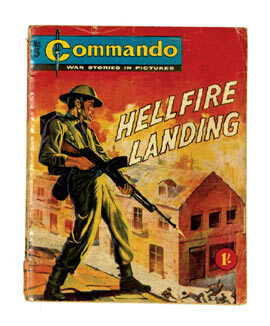 The focus of our winning bidder’s attention at £71 was a book that he’d been searching for since childhood. Outer Space brought inner peace. 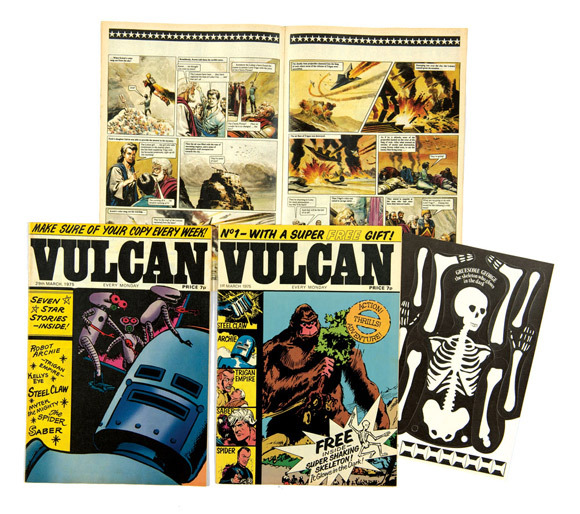 Vulcan was originally published with a small print run in Scotland (before a larger UK print and nationwide distribution) so the north of the border issues are rare. 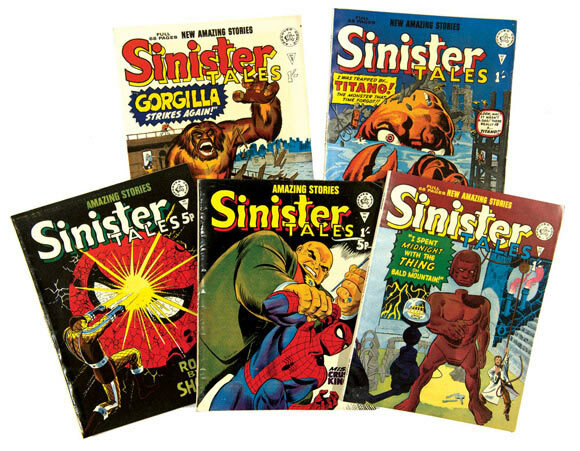 Here were the first sixteen issues [fn/vfn] reprinting Mytek The Mighty, The Spider by Reg Bunn, Trigan Empire by Don Lawrence, The Steel Claw by Jesus Balasco and Robot Archie by Bert Bus, including the free gifts for 1, 2 and 3. Hotly contested, No 1’s Glow In The Dark Skeleton positively beamed at £385. 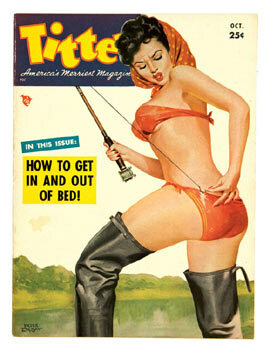 Advice to the glamour mag collector was always in plentiful supply during the 50s. Titter from October 1952 advised him ‘How To Get In And Out Of Bed’ whilst Whisper from January ’53 told him where to find Summer Love Playgrounds and Hooded Honeys Of Horror. I’m guessing it wasn’t at Butlin’s. 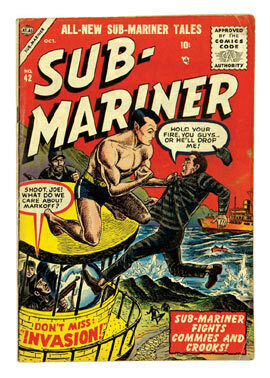 A taped spine copy of Adventure #100 with Sandman cover and story by Simon & Kirby made £71 and Sub-Mariner #42 (1955) the last Golden Age issue harpooned a good value £91 in [vg] with no major defects. Here was one of the best Fantastic Four #1 copies we had seen for a while. 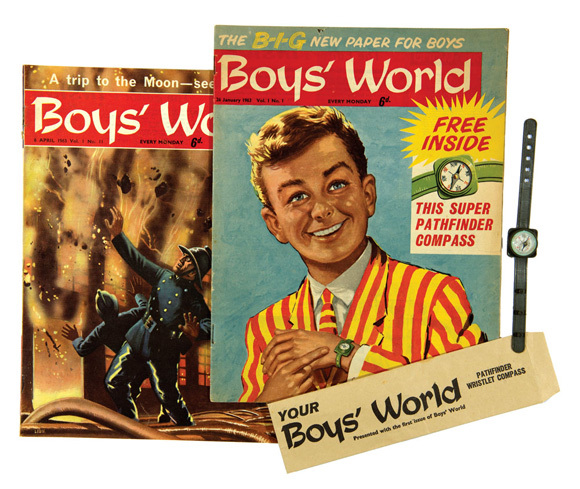 With good cover gloss and some light wear our collectors knew that its Fine Plus grade made it a serious proposition. Estimated at £1200-1500 the lot was finally knocked down at £2000, the winning bidder ecstatic with his purchase and telling his worried children at the official hand-over ceremony (local caff in Camden) ‘Don’t worry, it won’t come out of your pocket money’. Uni may be another matter. Six months ago we reported from the letters page of a 1950s Boys’ Own Paper and there was such a good reaction that we’ve decided to have another go. This time we’ve chosen a girls’ comic from November 1960. Jill Aubrey (age 13) of Swansea, South Wales writes: ‘Here is a tip which may be useful to PRINCESS readers. I had some candle grease on my woollen gloves and Mummy told me how to remove it. I put some brown paper over the glove and then pressed with a very hot iron for a few seconds. This removed the grease completely (and most of the skin from my now-deformed hand). Sometimes, for sanity’s sake, you just have to add your own punch line.